The legs of the kneeskin are designed with dual fabric construction. Providing them with a smart stretch technology for targeted muscular compression, but still allows excellent of freedom of movement. 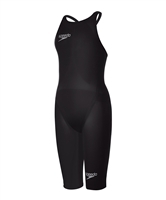 Maximised support seam construction to promote correct body positioning through the water. The support seam construction improves the linkage of the body’s muscular kinetic chain. Rear stability seams cross at the back of the kneeskin to connect the lower body muscles with the shoulder muscles. This helps to maintain the optimal position in the water.